A location once referred to sympathetically by John Hume as "the forgotten peninsula", has been thrust into world-wide golfing consciousness by the $7m Dubai Duty Free Irish Open. And a South African is doing his bit, in the person of Erik Van Rooyen, whose third round of 66 yesterday swept the joint leader four strokes clear of his closest challengers, on 14 under par. Though he has yet to win on the European Tour, the 28-year-old has shown decent form with three top-10 finishes this season, and has two victories to his credit at lower levels. Gifted pursuers, however, include a revitalised Danny Willett, the 2016 US Masters champion, who had a run of four birdies from the 11th en route to an admirable 69. While Ireland's challengers struggled, defending champion Jon Rahm discovered serious sparkle with an overdue 67 for six under par overall. Describing an outward 30 as "about as flawless a front nine as I can play", the Spaniard was disappointed with nine straight pars from there. "I wish I could have hit more fairways on 10 through 15, although the wind being a lot different made it a little harder," he added. "It's frustrating. I felt like I could have gone a lot lower." One suspects, however, that he would need some help from the leader if he's to complete the double of the Spanish and Irish titles which his idol Seve Ballesteros achieved in 1985. And Van Rooyen looks ready to grab his chance, on the evidence of an outward journey of 29 with birdies at the first, second, fourth and three in a row from the seventh. This from a player whose first experience of links golf was two years ago in the Dunhill. Around lunchtime, a hint of drizzle almost caused consternation, but the thought of a mad scramble for umbrellas remained just that, until the threat of rain eventually materialised in a tolerable shower in mid-afternoon. By then, it was clear that serious progress could be made if a player got the putter working. With a sparkling, bogey-free round of 65, 31-year-old Englishman Andy Sullivan finished with birdies on the 16th, 17th and 18th to surge from the cut-limit of tied 63rd overnight to a top-10 position on six under par. 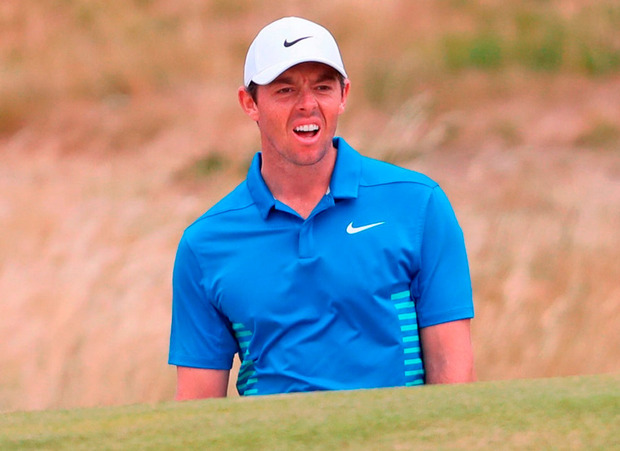 Rory McIlroy was down at heel after returning a level-par 72 in basically the same conditions. After the missed cuts of recent years in this event, with the notable exception of his 2016 triumph, it was a boost to have him for the weekend, though from his perspective it wouldn't have looked that way. The manner in which he attacked the course was reflected in 12 wedges as approach shots. Yet they weren't hit close enough to compensate for indifferent putting. "It's tough walking off the course with even par when you've given yourself so many chances," he said, after 30 putts. Then, echoing Graeme McDowell's sentiments from earlier in the day, he added: "This golf course looks like you should go out and shoot five or six under par every day, but it's a little trickier than that. I felt like I would have given myself a decent chance tomorrow had I shot something in the region of 67." While all five home survivors fought the good fight in maintaining local interest, the departure of Padraig Harrington on Friday evening was a blow to his many admirers, especially after an opening 68 on Thursday. The Dubliner was seriously at odds with his driver in a second-round 78 which contained double-bogeys on the 13th and 18th in a homeward journey of 40. You get the feeling with Harrington that while the spirit remains willing, consistency has become frustratingly elusive. From early morning, lines of spectators had claimed familiar vantage points, notably on the towering ridge to the left of the second green and eighth tee. There, from elevated positions close to the tees on the back-to-back par-three seventh and 14th holes, they could also take in the 13th green below. Overall, Glashedy is a good viewing links with an out-and-back configuration and as excitement heightened, eager fans took full advantage. And there was never a chance of the course being slaughtered, contrary to McDowell's well-intentioned warning to club officials on pro-am day. "I was sort of preparing them for 25-under," he later explained. Perhaps the key to unexpectedly testing conditions lay in yesterday's post-round reaction of McDowell. "The firmness of the golf course is making it very difficult to keep the ball in play off the tee and to stay out of the bunkers," he said. "It's also hard to get close to the flags. So, scoring is tricky, even though we couldn't really be having this course any easier than we're having it." Shane Lowry's four birdies were more than offset by six bogeys in a pretty indifferent 74 which left him back in a share of 41st place with Simon Thornton, who won a qualifying play-off at Rosapenna last Monday. Meanwhile, Paul Dunne's struggle to repeat his runner-up form from the Spanish Open was hardly helped by a double-bogey six on the 10th, en route to a 72. Lamenting the fact that the Inishowen Peninsula didn't "get the attention it deserved," Nobel Peace Prize winner Hume said: "The hospitality of the people is overwhelming and the beauty of its distinctive and varied scenery is stunning." There could hardly be a more accurate assessment of what we're experiencing this weekend.